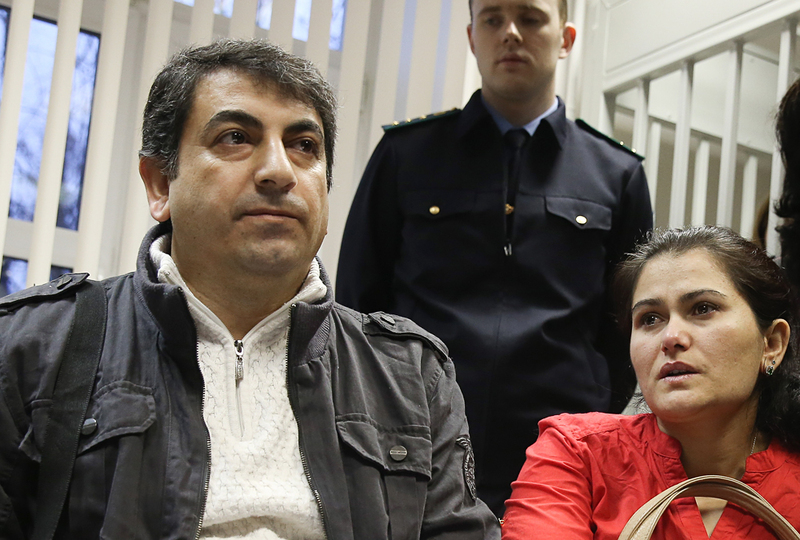 Syrian citizen Hassan Abdo Ahmed and his wife Gulistan appear at the Khimki City Court for a hearing into the case of their family who tried to cross the border into Russia using forged passports. The family of Syrian Kurds who stayed in the transit area of Moscow's Sheremetyevo airport has been granted temporary asylum, the family's lawyer said. "The Federal Migration Service [FMS] department for the Tver region had granted the family temporary asylum, thus recognizing them as refugees," lawyer Roza Magomedova told Interfax on Monday. The Russian authorities had acknowledged that the family members had reasonable grounds for leaving their homeland and coming to Russia, she said. "Now they can absolutely legally stay in Russia, travel the country and find employment," Magomedova said, pointing out that by today a limited number of foreigners have managed to receive refugee status in Russia. In the event of the making of the amendments to the law which are currently being discussed by the parliament, the family members would be able to file the documents to get residence permits or receive citizenship. As was previously reported, the Syrian family stayed in the Sheremetyevo airport transit area from September 10 to November 20, 2015, and were later placed at an FMS provisional settlement center in the Smolensk region. The Civic Assistance Committee said that the family consists of the head of the family, Hassan Ahmad Abdo, a Syrian Kurd from Afrin, his wife Gulistan Shao Issa, who had come to Syria from Kazakhstan years ago, and four children, aged from three to 15. They came to Moscow from Iraq, where they had received visas at the Russian consulate. The family had lived in Erbil for the past several years but decided to leave Iraq due to the attacks of the Islamic State (terrorist organization banned in Russia). The family has relatives in Samara, the committee said. The Khimki District Court conducted the case of the family of Syrian Kurds' trial on November 19, 2015. The court ruled that they were guilty of attempting to cross the Russian border without the necessary documents (under the articles 30, 322 of Russian Criminal Code) and sentenced them to a fine of 10,000 rubles. Last October FMS said that the Syrian family might be granted asylum in Russia after the court verdict had been delivered.